Kimberley rock art could be among oldest in the world. Scientists and Aboriginal elders are hoping the most comprehensive study of rock art done in the Kimberley region may confirm the images to be among the oldest made by humans anywhere in the world. The Kimberley Foundation Australia and the Australian Research Council are supporting two major projects called Rock Art Dating and Kimberley Visions. Click on the project links below to find out more on KFA-initiated projects. An extended dating project “An absolute timescale for the Aboriginal rock art of the Kimberley region – landscape processes and multiple chronometers” follows the pioneering work undertaken in the first Kimberley Rock Art Dating project (2014-2017). The project will run for four years from 2018 and has been awarded a major Linkage Grant by the Australian Research Council with support from the Kimberley Foundation Australia. The RAD-2 project will use new knowledge of complex processes on sandstone surfaces across the north Kimberley and an innovative combination of four scientific dating methods developed in the earlier work. The project expects to establish a well-dated sequence for Kimberley rock art based on replication of results and confirmation across different methods, all conducted in collaboration with Traditional Owners. The project is led by Prof Andy Gleadow together with Profs Janet Hergt, Jon Woodhead and Drs Helen Green, John Hellstrom and John Moreau from the University of Melbourne, Prof Peter Veth and Dr Sven Ouzman from the University of Western Australia, Prof Bert Roberts and Dr Tibi Codilean from the University of Wollongong, Prof Roy Goodacre from the University of Manchester, Dr David Fink from ANSTO and Cecilia Myers from Dunkeld Pastoral Company. The Dating project is supported by the Australian Research Council and Kimberley Foundation Australia. Partners include the University of Melbourne, the University of Wollongong, the University of Western Australia and ANSTO. Partner Investigators include Dunkeld Pastoral Co Pty Ltd, Kimberley Foundation Australia and Archae-aus Pty Ltd. The work is being done in collaboration with Balanggarra Aboriginal Corporation. Samples: Wasp Nests, Material: Quartz grains, Dating: Time since nest was built. OSL dating is based on the principle that quartz grains accumulate electrons over time but when exposed to sunlight all of these electrons are expelled-resetting the clock. When a mud wasp carries a mud droplet to it’s nest on a rock art panel, quartz grains held in that droplet are bleached by the light, resetting the OSL clock. This grain is then buried within the nest and allowed to accumulate electrons again- if we measure how many electrons there is we know how long that nest has been there and that the painting underneath must be older. Wasp gathering mud droplet (left) and building it's nest on a rock art panel (right). Wasp nest stubs under pigment of a 'Tassel' figure motif (left), Wasp nest over pigment of a 'Sash' figure motif (right). Samples: Mineral Crusts, Material: Phosphate, Dating: Time since mineral formed. U-series is usually applied to calcite in limestone environments. The remarkable finding of the last 12 months has been that it can be applied to phosphate minerals in the exposed sandstone environments of the Kimberley- a world first. These minerals precipitate out from water which contains a certain level of Uranium but no Thorium. Over time the U decays to Th and by measuring the amount of each we can work out how long that mineral layer has been over the art surface-and that the painting must be older. Mineral fringe formed around art panel (left), photo enlargement of minerals formed on sandstone (right). The mineral accretion is a mounted and polished piece that gives a cross-section through the detailed internal stratigraphy (layers). The overlaid scans are laser ablation trace element maps (the laser vaporises a bit of material in each layer and sends it to the mass spectrometer which analyses the concentration of certain elements)- in this case they are showing us where Uranium is focussed. ‘PPM’ on the scale stands for parts per million (so its a tiny amount). Yellow is high, scaling down to black at 0. Layered mineral accretions collected from mineral fringe (left), Laser ablation trace element scans showing where the Uranium is focused (yellow) (right). Samples: Wasp Nests, Material: Organic Material, Dating: Time since organism died. Mud wasps also furnish their nests with paralyzed spiders or caterpillars. When an organism is living it is constantly exchanging the radioactive isotope carbon 14 with the atmosphere. When that organism dies the exchange stops and the 14C starts to decay to the non-radioactive isotope, carbon 12. The radioactive decay occurs at a fixed rate so by measuring the ratios of the different carbon isotopes we can work out how long it has been since the organism died. That will tell us how old the carbon in the nest or beeswax is likely to be. Beeswax figure (left), Modern nest over hand stencil motif (centre), nest stumps under pigment of motif (right). Samples: Sandstone fragments, Material: Cosmogenic Nuclides, Dating: Time since slab fall. Cosmic rays are constantly bombarding earth. The slabs shown in the examples below are protected from these cosmic rays until it falls and becomes exposed. Once exposed the absorption of these rays generates ‘cosmogenic isotopes’ that we can measure to tell us how long it has been exposed for. If there is art on that slab we know the art must be younger than the fall. 'Tassel' figure panel (left), the legs of figure can be seen on the face of the fallen rock. Fallen ceiling slab with art painted before the fall on the underside of the exposed rock. Kimberley Visions is a five year landmark study mapping the rock art and occupational history of the Northern Kimberley. It examines shared art styles across northern Australia and explores questions of regionalism and identity. Did similar styles occur between the Kimberley and Arnhem Land? What are our current understandings about shared traditions and why might they have changed through time? The rock art of the Kimberley is renowned for the insights it offers into the deep history of Aboriginal social practice. The art often depicts people, their belief systems and environments in great detail with elaborate compositions, depictions of personal ornaments and scenes of group dynamism providing windows into millennia of cultural practices. Rock art as living tradition is realised through a research collaboration with Balanggarra Aboriginal Corporation and their Healthy Country Plan. Chief Investigator, Prof. Peter Veth, is the Kimberley Foundation Ian Potter Chair in Rock Art at UWA. Peter is one of Australia’s leading archaeologists. The other Chief Investigator is Dr. Bruno David from Monash University. Prof. Andrew Gleadow, a distinguished geologist brings expertise in rock art dating which is fundamental to the project. Assoc. Prof. Sven Ouzman has a considerable reputation in rock art research and is also on the Dating project team. Kimberley Visions includes world leading French geomorphologist Jean-Jacques Delannoy and renowned archaeologist Jean-Michel Geneste. Both Frenchmen have previously worked with Bruno David on the rock art cave at Nawarla Gabarnmang (NT). Delannoy is at the University of Savoie (France) and Director of the research laboratory EDYTEM (Environment, Dynamic and Mountain Areas). He led the scientific committee which advised the French government on the famous Chauvet cave facsimile. Geneste was the General Curator of Heritage and Director of the Center National de la Préhistoire, the only laboratory in France devoted exclusively to the scientific studies of rock art sites. Conservative then research director of the cave of Lascaux, he has been attached to the archaeological study of ornate caves for more than two decades. He directs the multidisciplinary study program of the Chauvet-Pont d’Arc cave, which brings together some fifty researchers of international origin. 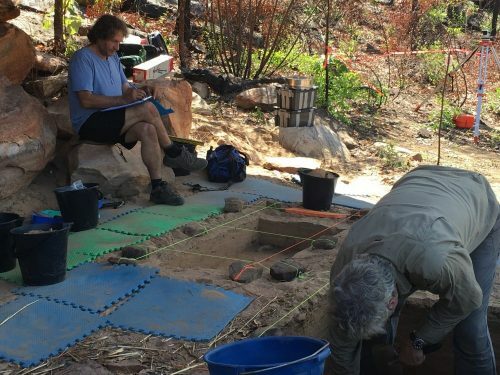 Peter Veth (UWA) and Bruno David (Monash University) led three excavations at Wandjina Rock shelter and at another site with more than 1,000 cupules. Jean-Jacques Dellanoy from the French National Centre for Scientific Research carried out geomorphic interpretations of the formation history of the shelter and helped direct excavation towards recovery of wall fragments, possibly with art on them. A rich record of flaked and ground stone artefacts, grinding slabs, ochre and hearths have been recovered with samples being submitted for dating. Further work will be carried out at this rich site in 2017. 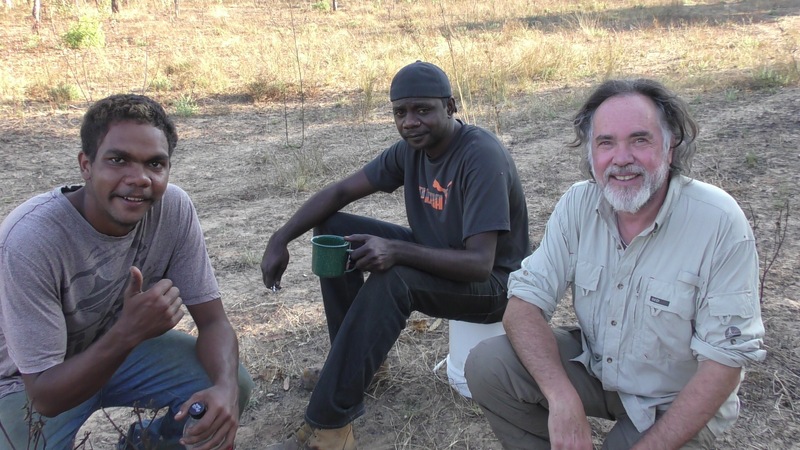 At Oomarri on the King George River Traditional Owner Ambrose Chalarimeri and the Balanggarra Indigenous Protected Area Rangers oversaw and participated in an ambitious excavation program at a major site complex on a lake and adjacent a very rich rock art locale. Covering several hectares this occupation site was excavated to below 2.20 metres revealing intact hearth stone arrangements, flaking floors and implement production areas. Optical stimulated Luminescence (OSL) and 14C samples were taken. Another excavation was carried out in a smaller shelter with art as well as dating of crusts and mud wasp nests. Over 150 new sites and complexes were recorded at Oomarri and surrounds. The survey and excavation program will continue in 2017. The UWA team returned with staff from Universidad de Tarapacá, Chile and La Trobe University to complete the third month of fieldwork during September in the Forrest River catchment. They surveyed, often for the first time, areas for rock art and occupation sites with Rangers and Traditional Owners using helicopter, boats and on foot. Research to establish a series of long-duration paleo-environmental and paleo climate reconstructions for the Kimberley region spanning the last 60,000 years has been awarded an Australia Research Council grant of $460,429. The project was seed funded by the Kimberley Foundation Australia. Hamish McGowan explains how studying the climate history of the region will determine how the environment and movement of people has changed. The multi-disciplinary research program Unlocking the environmental archives of the Kimberley’s past is led by Professor Hamish McGowan at The University of Queensland. KFA provided seed funding of $40k to support the initial research phase and will commit an additional cash contribution of $360k for the exciting next phase. KFA is a recognised collaborator and partner organisation in this research. The cash total of $860,429 over four years is supported with in-kind funding from both Dunkeld Pastoral Company and the KFA, leveraging the project a further $78k. Across much of tropical Australia the monsoonal climate affects sediments which we might typically use to investigate past environmental change. Monsoonal rains might scour away the sediment, and the wind may remove it during dry periods. Fossils within the sediments can also get affected by this seasonality as they can become weathered. However, in some locations across the Kimberley, springs containing deep peaty sediment deposits have been found which provide an exciting avenue for palaeoenvironmental research. 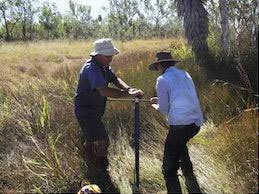 In 2005 Dr Andy Hammond and the late Grahame Walsh collected sediments from a number of sites, including Black Springs, which were donated to the University of Queensland. Initial analysis showed that these springs contained fossils and information for palaeoenvironmental research, including pollen and dust. As a result, a record of environmental change thought to be up to 15,000 years long could be developed from Black Springs. Based on this success, a team of researchers from the University of Queensland (UQ) and University of Wollongong (UoW) took samples from a number of springs across the Kimberley in the 2015 dry season. However, the initial radiocarbon dates didn’t follow this pattern. A team of researchers from UQ, UoW, James Cook University, the University of Freiburg and ANSTO were called in to assist. They found that the application of standard radiocarbon dating methods to the springs was problematic due to groundwater fluctuations and biological processes such as root growth down through the sediments. “We needed to isolate carbon from the sediments created at the time of past burning events” explains Emily. Emily and the team found that a relatively new radiocarbon pre-treatment technique, called hydrogen pyrolysis (HyPy) allowed that process to take place and removed most other contaminants. Emily finally obtained a logical sequence of radiocarbon dates for the springs using this technique. Next, the research team worked out whether the past environmental changes seen at Black Springs reflected broader scale climatic change across the Kimberley, or whether they were a response to local spring dynamics. “We did this by analysing three springs spread across a distance of 100km, and by looking at the microfossils and geochemistry of their sediments. Interestingly, each of the springs started to accumulate sediment at roughly the same time – during the deglacial around 14,500 years ago. This suggested to us that we were seeing a response to a regional scale change in climate at this time” Emily says. With the help of Dr Jon Tyler from the University of Adelaide, statistical techniques showed that there were indeed synchronous changes at the three springs in the geochemistry and non-pollen palynomorphs (ecological microfossils which are preserved alongside pollen but which are derived from other sources such as algae and fungi). “This showed us that these indicators were responding to regional scale changes, and that the springs were recording climatic changes across northwest Australia. This coincides with the global ‘4.2 ka event’ which was one of the most severe climatic events of the last 12,000 years, although there are limited records for this event from Australia. “It’s intriguing that we’re picking this up in the northwest,” says Emily. The records also show that the monsoon weakened 2600 years ago, with a period of particularly low rainfall between 2000 and 1000 years, before becoming more active again in the last millennium. To preserve and protect this country with its secrets, mysteries and treasures in the ancient caves and rocks is vital to understand Australia's early history. I am pleased to know that the Kimberley Foundation is researching and caring for this unique and ancient land so that future generations can appreciate the significance of our rich cultural history.